The European Commission’s Vice President Viviane Reding has always been a vocal advocate of her dossiers and doesn’t hold back with Cable Europe’s Gregg Svingen on data protection, her broadband legacy setting the record straight on equal opportunities for women in business – and suggesting a new invention. 1. Roaming remains one of the most high profile actions the European Commission ever undertook given its effect on both business and the consumer. Data protection stands out as another huge subject with repercussions that go well beyond just online concerns. What can you tell us about your continued plans in this area? Vice-President Reding, the EU’s Justice Commissioner: Earlier this year, the European Commission put forward a proposal to reform the EU’s data protection rules. Our goal is simple: we want to make the single market for European goods and services more accessible to businesses and consumers, boost our economy and have Europe continue to lead in setting international standards for privacy. In Europe, the protection of personal data is a fundamental right. This means that the personal data of an individual belongs to that individual and not to the companies holding the data. To make this right effective, people need to be in control of their own data. They need to be informed about how their personal data will be used in a clear and simple language, to give explicit consent to how this data is used and shared, to be able to access their own data, to easily take it to another provider or have it deleted if they no longer want it to be used. This is what I call the right to be forgotten. We want to clarify that citizens shall have the right — and not only the “possibility” — to withdraw their consent. This means ensuring that citizens have effective control over their personal data. Individuals should also be swiftly informed if their personal data are lost, stolen or hacked. These data breaches can affect millions of people worldwide. The Commission’s proposals are on the table and have to be agreed by the colegislators, the European Parliament and the EU Member States. The discussions are progressing well. It is my goal to have agreement on the new rules in 2013 under the Irish EU Presidency. 2. At your confirmation hearing you said you intended to be a strong Gender Equality Commissioner. What is the most important thing that the European Commission can do to help equality generally speaking, in business, and particularly, in the ICT world. VR: In these difficult economic times – when we are facing the challenges of an ageing population and skills shortages, in addition to the financial crisis – it is more important than ever to take advantage of everyone’s skills: both female and male. Gender equality has therefore become more than ever an economic issue. and in my previous job as the EU’s Telecoms Commissioner I pushed for more women in ICT. In 2007 I started the so-called “Shadowing initiative”. This means having young female professionals following a successful woman from the ICT sector (engineer, executive or politician) through a typical working day, meet ICT experts and get a taste of what it is like to work in the ICT sector. Hundreds of young professionals have been participating in this exercise. I am convinced this is a success for both the young professionals who get to see the ICT sector from a different perspective and for the companies who are trying to attract female talent. As a very concrete achievement in the area of Gender Equality since I have taken office, I would also mention the Directive on self-employed workers and assisting spouses that the Commission helped pushing through the European Parliament and Council in 2010. Selfemployed workers and their partners can enjoy better social protection – including the right to maternity leave for the first time – under this new EU legislation. The law considerably improves the protection of female self-employed workers and assisting spouses or life partners of self-employed workers. For example, they are granted a maternity allowance and a leave of at least 14 weeks, should they choose to take it. At EU level, this is the first time a maternity allowance has been granted to self-employed workers. 3. What can be done to address the gender pay gap and women’s roles in decision making? VR: Improving gender equality is an economic imperative. On average, women still earn 16.4% less than men for every hour worked across the entire EU economy. The gender pay gap is caused by multiple factors such as labour market segregation and differences in educational choices. We therefore need to address all of these factors to make a real difference to the pay gap and work with national governments. I have been inspired by examples such as a German software tool which allows companies to analyse the gender pay gap within their organisation and the Austrian system of annual reporting on the pay gap to improve income transparency in companies. To improve number of women in boardrooms, I gave self-regulation a chance. 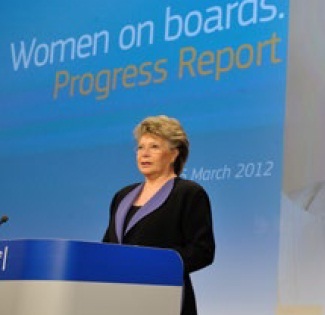 I called on Europe’s top CEOs to make a voluntary commitment to improve gender balance but since then the figures have not really improved – we had a change of just two percentage points EU wide (from 12% to now 14% of women on the boards of publicly listed companies). That is why the European Commission then launched a public consultation to study the different options on how to improve gender balance on boards. The consultation ended at the end of May and provoked considerable debate around the EU – we had over 500 responses from government, companies and other interested stakeholders. The Commission is now analysing different policy options.